The 1940s and 50s are often referred to as the Golden Age of science fiction. The appearance of the atom bomb at the end of World War II led to increased interest in science but fears of nuclear power, and the rise of the Cold War led to Communist paranoia. There was also a public desire for sensation, to be lifted out of their dull war and post-war lives. In literature, the appearance of Astounding magazine in particular, with a demanding editor John W Campbell, encouraged a high standard of work. It gave a start to great names like Isaac Asimov, Arthur C Clarke, and Robert A Heinlein. 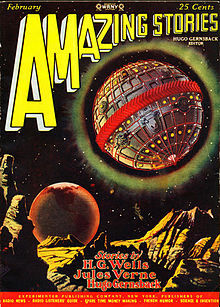 Later there were other magazines that took the genre further: The Magazine of Fantasy and Science Fiction, If magazine, a resurrected Amazing Stories, and Galaxy. Science fiction films came into their own. 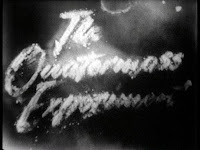 Many films were low-budget B-movies, but there were a significant number of successful films with big budgets and impressive special effects. Producer George Pal created Destination Moon (1950), When Worlds Collide (1951), The War of the Worlds (1953), and The Time Machine (1960), all of which won an Academy Award for Best Visual Effects, which demonstrated the increased technical excellence and critical recognition of the genre. In 1938 Orson Wells adapted The War of the Worlds for radio in America, and made it so realistic that it frightened everyone. The 1953 film adaptation tapped into Cold War fears. The Martian tripod ships were too hard to film, so they made levitating sleek ships – which was an influential design on everything that came after. 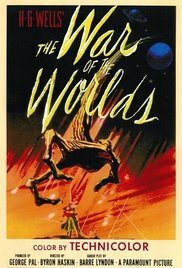 Alien films increased in popularity, like Robert Wise's The Day the Earth Stood Still, and Howard Hawks' The Thing from Another World (both 1951). Some films played on the fear of nuclear energy and the power it had to mutate: It Came From Beneath the Sea (1955), The Amazing Colossal Man (1957), The Incredible Shrinking Man (1957), The Fly (1958), and the most enduring, Godzilla (1954) from Japan. Science fiction also began to appear on TV. The Quatermass Experiment was shown on British TV in 1953 in a live broadcast, with Quatermass and the Pit following in 1958. They played on the fear of the unknown, but with a twist – the Martians came to Earth in the distant past and engineered mankind. America was showing serials like Captain Video (1949-55), Buck Rogers (1950-51) and Flash Gordon (1954-55). This is an overview of the Golden Age, which needs unpacking. I’ll be looking at all of these in the coming weeks.